With the Signature Collection braiser, the cook employs both wet and dry heats to break down tough cuts of meat and tenderize fresh vegetables. The pan's flat base allows for more than braising, including techniques like poaching, searing, roasting, stir-frying and browning. The Signature Collection braiser also features a low profile that makes it a convenient serving solution for crowded tables and buffet-style settings. 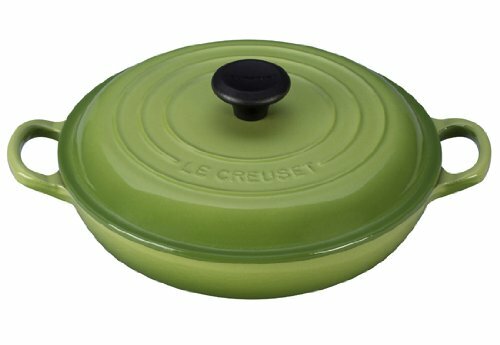 From rich risottos and spicy curry to jasmine rice for stir-fry, every Le Creuset braiser is well-suited for preparing a wide range of main courses and side dishes that require careful moisture control. The superior heat distribution and retention of le creuset enameled cast iron.Signature black phenolic knob is oven-safe up to 500°F.Stainless steel knob is safe at any oven temperature.